Keep the look of spring in your home, long after spring has passed. 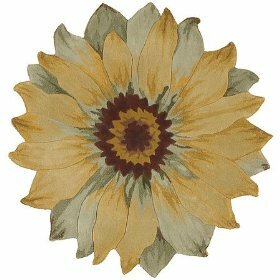 Nourison have designed this beautiful sunflower shaped wool rug as a reminder of the warmer months. The Nourison Blooms Flower Shaped Wool Rug is made from hand tufted, 100% wool in shades of yellow, green and with touches of brown. The flower has a dark brown and mustard colored center. It is recommended that this lovely rug be professionally cleaned when required and simply spot clean between cleanings. The rug measures 3′ in diameter. This is just another example of the exquisite Nourison range of rugs. You will find more beautiful Nourison rugs at Amazon.com .